A few years ago, I bought my first Osprey Games blue book – A Fistful of Kung Fu. I wanted to give these games a try for sometime because of their value. At $20 a book, it isn’t going to hurt the bank taking a chance on these rule sets. A Fistful of Kung Fu is the sixth book in the blue cover series, and it happens to be a good game. This post is a quick review of that game. A number of things drew me to this book. I knew that the game A Fistful of Kung Fu is based off of is well respected (A Song of Blades and Heroes). The price of the book could not be beat. At under $20, I did not care if the game was good or bad – I just wanted to try it out. Finally, I bought this game as an excuse to reuse my RAFM USX: Modern Day Heroes Miniatures. Now that I have the book, I can tell you I did not waste my money. This is a good game. Andrea Sfiligoi stylized A Fistful of Kung Fu to capture the essence of a Hollywood Kung Fu Movie. He encourages larger than life action, through the use of three tiers of characters. The Protagonist is the main character on each side. This person has the larger than life abilities and represents your movies primary hero. Next up are the Bruisers. Bruisers are the guys next in skill to the “bosses” and main characters. They put up a good fight, but are not the true heroes of the game. Finally, there is the Extra. Extras are your fodder. They are there to get beat up by the Protagonists and to add a bit of a speed bump to the heroes progress. Obviously, a Protagonist is more than a match for a few Extras. The level of character determines what skills they can have and their statistics. Statistics wise, there are only two statistics to track. That said, there is a wealth of skills that influence rolls in stituations that characters can select. I find it easiest to use the same skills for all of my Extras so as to not confuse the game. I like keeping this one simple. It makes for a really good Beer and Pretzels (or Convention) game. The primary difference that I found with this game compared to other options out there (like Games Workshop) is the method for Activation. On your turn, you make select each character you have once. The order you do it in is up to you. You then decide how many activation dice to roll. The value you need to match or better is based on your character tier. You can roll one, two or three dice. Each die you pass with gives you one action. Below is a sample page about Character activation. 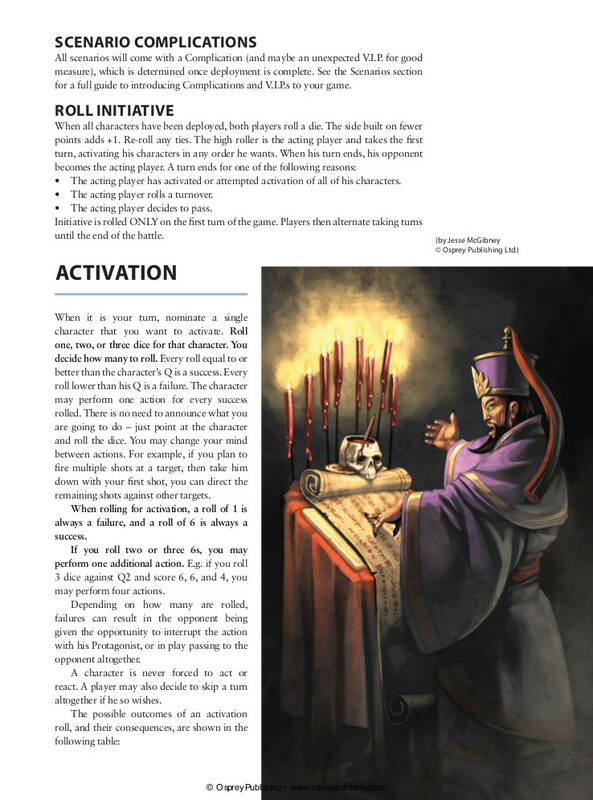 A sample page about character activation. If you fail any of those rolls, the opponent’s Protagonist gets a free action. Each fail gives them a free action. Fail three and the enemy’s Protagonist may take three actions. Also, if you fail by three dice, your turn is immediately over. The Protagonist of the other side gets their two free actions and then the turn passes over to them. If you manage to get through your full force without failing three dice rolls on a single unit, then you successfully completed a full turn and the control passes over to the other player. This sequence goes back and forth until the end of the game. As you can tell, there is a real push your luck element here. Do you go with three dice on a figure to get more actions? If you do, you risk losing the turn to your opponent early. Also, every time you fail, the enemy’s protagonist gets a free action. This leads to a real feel that the Protagonists are super-humans capable of larger than life actions. If you want to play a game with the feel of a Kung-Fu movie, this book captures that perfectly. To resolve combat, compared dice rolls are made with modifiers. Depending on how much you succeed by, you consult a chart and choose a result. The more you surpass your opponents roll, the better effect you can choose to execute. There are separate charts for ranged and melee combat. 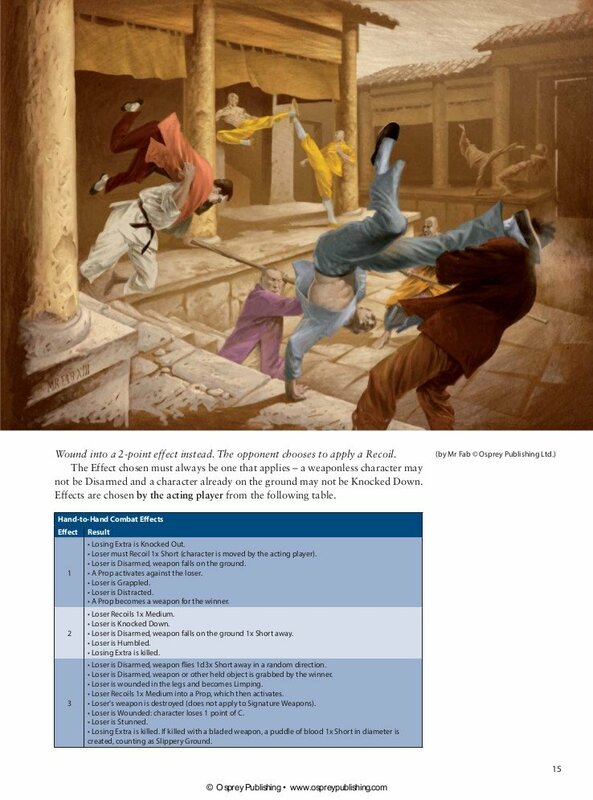 Below is a sample page from the book with the effects table for Hand-to-Hand Combat. A look at the melee combat chart of what successes do in A Fistful of Kung Fu. BTW… I really like the artwork in this book. If you look closely at that chart, you can tell that extras get taken out really easily. Do not get attached to your extras. They are there as fodder. Your real hero is the protagonist. Being that this is a short review, I will end it here. If you want a game where one main character is super powerful and can kick the daylights out of anyone on the table aside from a “Boss” or a couple of Bruisers, this game is for you! Personally I am a fan of this system. It takes some getting use to as it is not I Go You Go, but once you are used to it, it is great! My articles on Must Contain Minis about A Fistful of Kung Fu are some of my very early pieces. Since then, my work has improved greatly, but the stories are still worth checking out if you want to know more about A Fistful of Kung Fu. 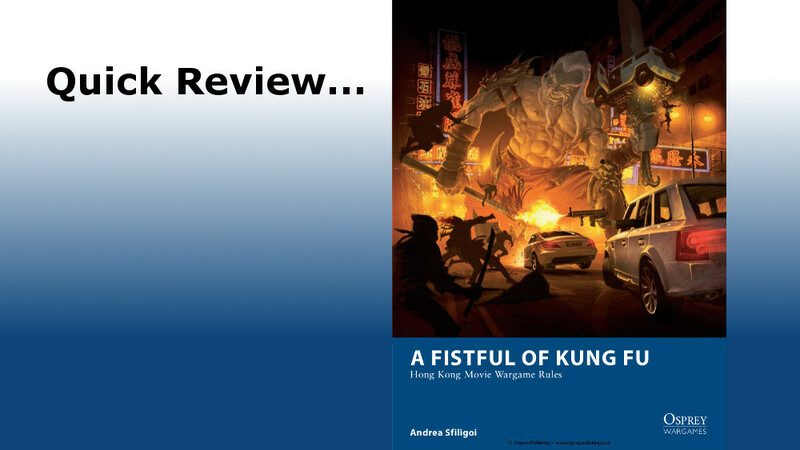 Review of A Fistful of Kung Fu. This Review is more detailed than the quick review here on Bell of Lost Souls. A Convention Game Battle Report. A Round Up Article of 11 stories related to A Fistful of Kung Fu.